The Tinsa property price index for November shows that average prices fell by 6.6% over the last 12 months, down from 7.4% last month. That’s the smallest fall in a year. As you can see from the chart above, price falls stabilised at around 10% in the first half of the year, and started shrinking from July onwards. On present trends prices will be rising again within a few months. Property prices are already reported to be rising strongly in the UK. The price of the average house is up by £13,000 to almost £168,000 since the trough earlier in the year, according to Halifax. 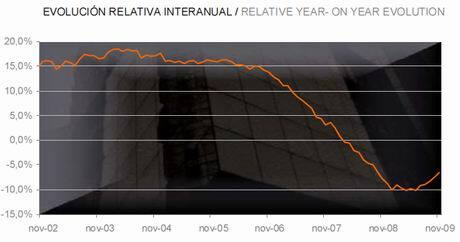 Moving back to Spain, even the price of property on the coast is falling at a slower rate, narrowing to -8.9% in November, just above what it was a year ago (-8.5%). Coastal property prices have been hit the hardest thanks to the surplus of holiday homes for which there is little market in a recession. There was a dramatic improvement in the index for The Balearics and The Canaries, where prices were down just 3.2% on a year ago. Note that Tinsa’s index is based on valuations carried out by the company, not on actual transaction prices. You have to assume the margin of error is very wide.